We know you don’t want to spend it bouncing between websites trying to find the best promotional products at the lowest price. You also shouldn’t have to wait weeks for your order to arrive. 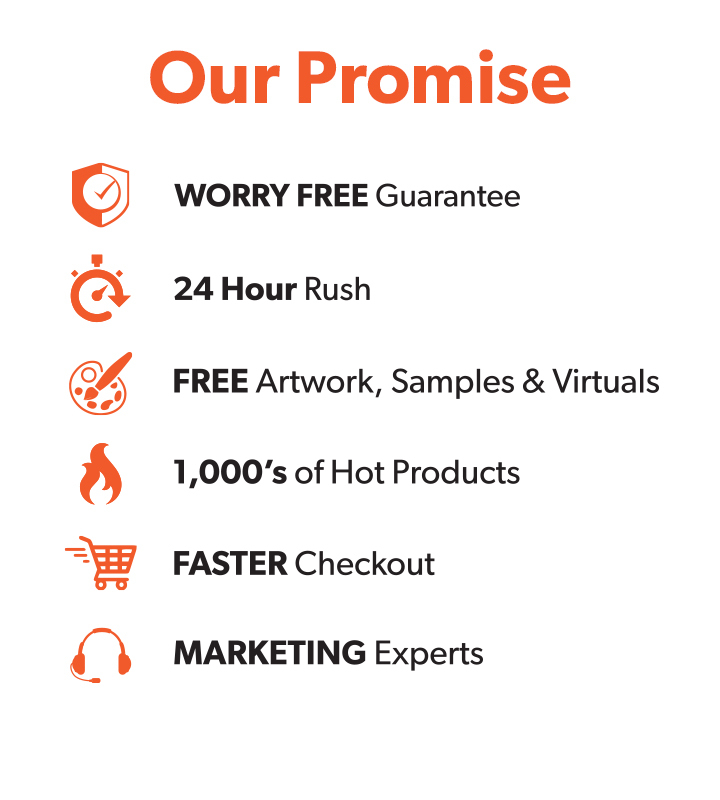 At rushIMPRINT, you’ll quickly find exactly what you need and receive it at your doorstep promptly. From customized apparel to imprinted tech and everything in-between, we have a vast assortment of branded merchandise that can be customized and shipped in as little as one business day. Choosing the right products is important to you. Our merchandising team works to make sure you have access to a diverse range of popular and trending items. It’s our mission to source the hottest products while keeping them competitively priced. Don’t see what you’re looking for? Let us know. We’ll find it. Have a question about your order? Need a quote on 250 custom sunglasses? Maybe you’d like assistance from one of our product specialists. Whatever your reason, don’t hesitate to reach out to us. Call us Monday through Friday from 8:30 a.m. to 5:00 p.m. EST at 1-866-277-7874. If you prefer electronic communication, our live chat operators are standing by, or you can email us at info@rushimprint.com. Drop us a line. We’re looking forward to earning your business. Because our neighbors to the north have unique needs, we’ve developed rushIMPRINT.CA, a site dedicated to serving our Canadian customers.